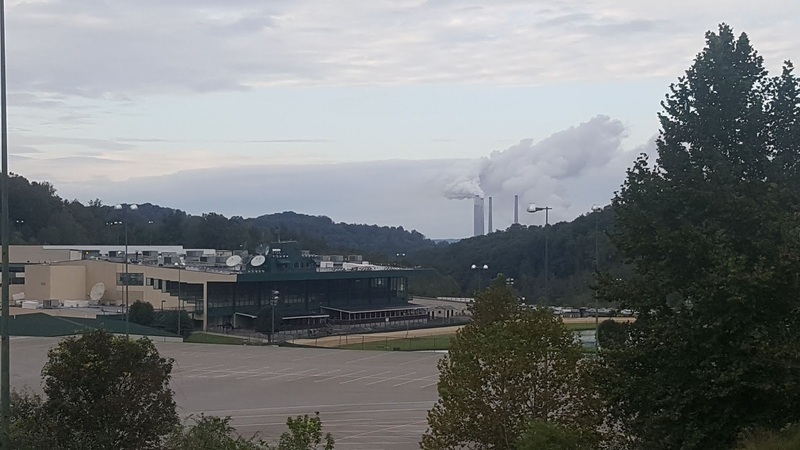 7:21 am - Monday - October 15th - Cross Lane, WV - 60º F, 97% humidity, wind 2 mph out of the south by southwest.....heavy cloud cover....rained most of the night. Forecast high for today is 70º F....a big improvement. 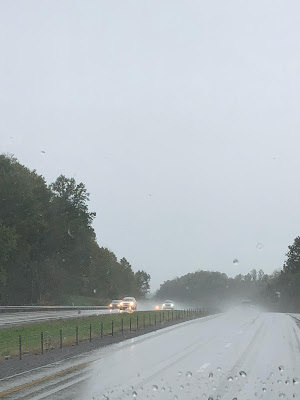 ......but within minutes of merging onto I-79 it began to rain, and that was most of the story for the 146 miles we covered through the West Virginia mountains.....rain, rain, and more rain. The weather guessers guessed wrong Sunday. For the first 40 miles the terrain was remarkably flatish.....hence I am remarking. That is, it was mostly flat until after our first rest stop, then the Interstate reverted to form with a vengeance. Up down, up down, up down for the next 100+ miles into Cross Lanes, WV. Why Cross Lanes, WV you ask? Well, there was a Walmart Supercenter right off the Interstate, plus a Lowe's, and also a large casino/racetrack with an enormous parking lot. We figured one of them might work for us. We arrived in Cross Lanes about 1:30 pm, in the rain, to find the Walmart parking lot quite full, and signs everywhere advising "No overnight, or long term RV, or Truck Parking".....TLE had checked online prior to our departure from Fairmont, WV, and there was no mention of no parking at this Walmart, but it was quite crowded anyway, so we moved on down the hill to the Mardi Gras Casino & Resort which has, as I mentioned previously, a very, very large parking lot, most of which is empty most of the time. 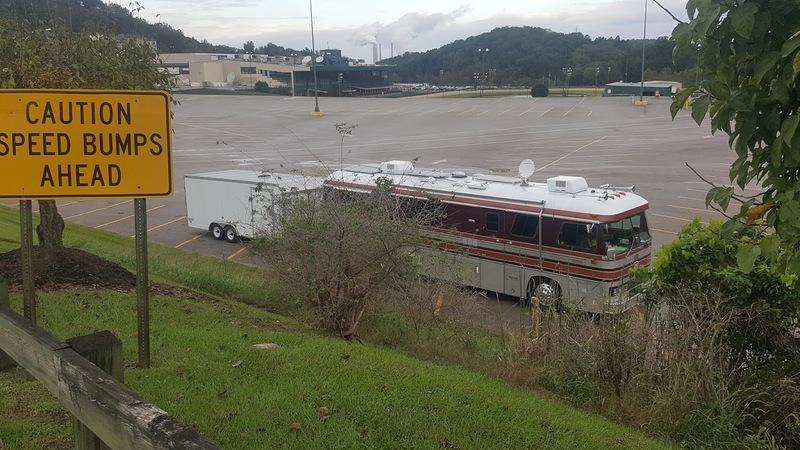 We quickly found an isolated spot in the far corner of the lot, parked, and then leveled. There are no 'NO OVERNIGHT PARKING' signs to be seen.....perfect! 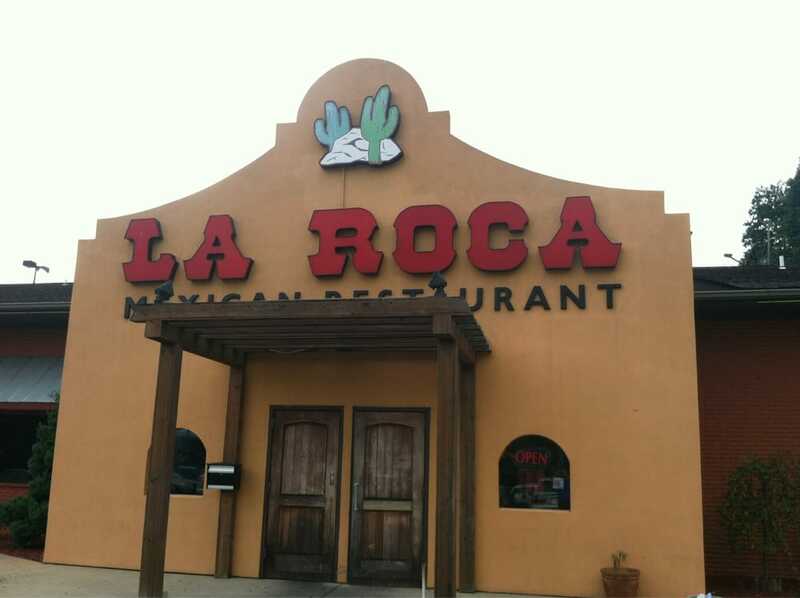 On our way into the casino parking lot we noticed 'La Roca Mexican Grill' at the top of the hill, so we set our minds to visit them later in the afternoon for an early dinner. It was about 1/2 mile walk back up the steep hill on a road with no shoulder, and we did not want to be walking that road after dark. ......the chips and salsa were wonderful! 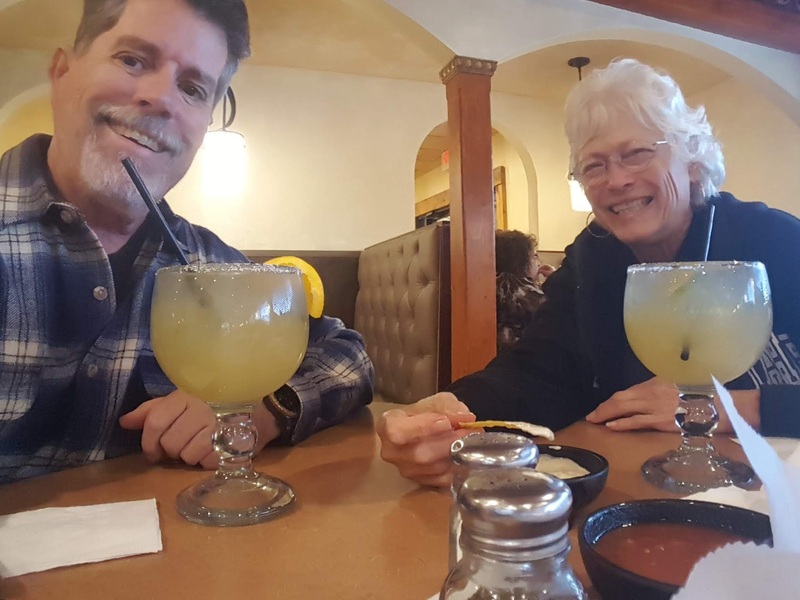 TLE ordered their Quesadilla Texana, which she loved, and I ordered their 2 tacos/1 beef enchilada combo plate. My dish was fine, but did not have that 'WOW' factor. Overall I enjoyed our experience at La Roca. Yelp does give them 4 stars on 43 reviews....I would be more in the 3 star range.....passable for West Virginia. We were back home by 5:40 pm relaxing, and watching game 2 of the ALSC between the Houston Astros and the Boston Red Sox. Houston won game one, and the Red Sox ended up winning game two by a score of 7-5, so both the NLCS and ALCS series are tied at one game apiece as they go into game three of the their best 4 out of 7 series. We were in bed by 10 pm listening to the pitter patter of a light rain on our roof.....thanks for stopping by! When you shop Amazon, please use our link (below) to access their website.......we will appreciate every purchase you make using our Amazon Affiliate link, and remember, using our link will not add one penny to your purchase, plus we will receive a small commission which helps defray our travel expenses to a small degree. Number 47....can I get a drum roll?